This could very well be the beginning of a new age! If China revalues the renminbi, the two-state solution finally gains traction in the Middle East, Google acquires the rights to most of human thought, and North Korea’s Kim Jong-il finally acknowledges his polymorphic perversity and stops trying to silence critics of his dictatorship, then we can only assume that the problem of cold fusion will soon be cracked. Imagine a world in which energy is no longer something that major powers fight over. As Freud once said about analysis, once it’s over, the real problems begin. If we accept Marx’s analysis, the drive for economic hegemony infuses international politics. Without the struggle for resources, life will lose its meaning and many world leaders will walk around with sunken eyes, like Max Von Sydow losing his game of chess with Death in The Seventh Seal. 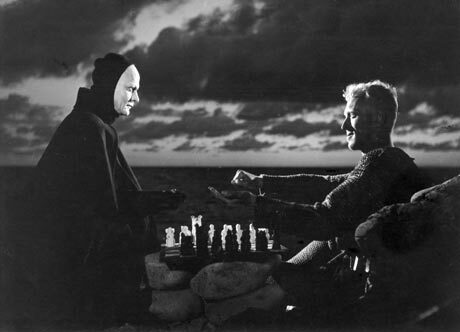 Something tells me that Max Von Sydow lost his proverbial game of chess with Death a long time ago. And death was played by Jane Fonda in the remake.